Fui So means “ability to rejuvenate” in Mandarin. I learned this from Wong Lai-yin, a Chinese participant in last week’s Transition Towns event in London. 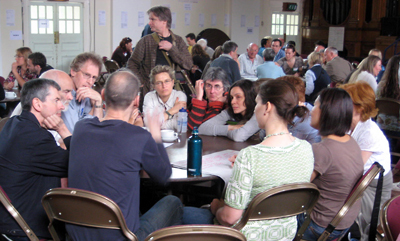 Transition initiatives and groups are multiplying at extraordinary speed: 170 communities have been officially designated Transition Towns (or cities, districts, villages – and even a forest); and a further 600 communities are “mulling it over” as they consider the possibility of kicking off their own Transition Initiative. The atmosphere in London was remarkable. A powerful positive energy suffused the 400 focused participants. But the mood was practical and collaborative, not at all apocalyptic. The transition model (I’m quoting their site) “emboldens communities to look peak oil and climate change squarely in the eye”. These were 400 no-longer-scared people getting on with preparations for what is to come. As a word, resilience (or “Fui So”) is powerfully more positive and motivating than “sustainability”. 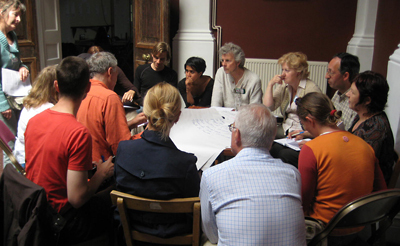 Many of the sessions were run on open space lines: anyone could suggest a topic and lead a discussion – and anyone else was free to join in, or not, as they wished. 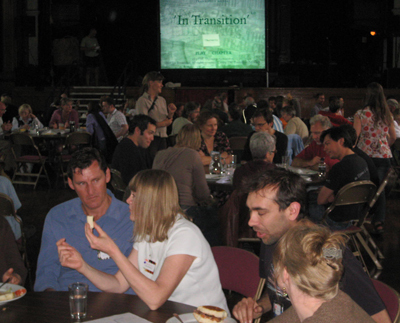 The Transition WIKI opens with the statement, “Here’s how it all appears to be evolving…”. That statement helps explain why the movement is growing so fast: The founders don’t know what each group is doing, and they don’t need to. The whole thing has been designed to be emergent and scalable. The fact that this was a middle class and mostly white group of people worried several people in the crowd. There were calls for more diversity and inclusivity. I’m sanguine about this. 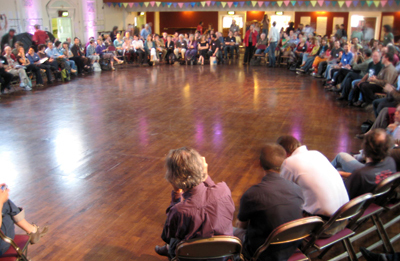 The roots of the movement are what they are – but the model seems to me to be infinitely adaptable. Besides, thousands of other models are emerging out there, too. On the Friday evening a 15 minute talk by Stephan Harding convinced me, finally, that Earth is Animate. Then on Saturday morning, a presentation of the Transition web strategy was the best thing I’ve heard in 15 years. (More on this shortly). I’d say: join one, or start one, now.